Yannick Alléno is now in charge of the food service of the Hotel Sofitel Paris Le Faubourg. He recently launched there his new restaurant, STAY Faubourg, based on a concept already developed in Dubai, Taipei and Beijing. Installed in a cozy setting, patrons treat themselves with foreign flavors such as red curry poultry and monkfish cheek tagine. Refined desserts are suggested to finish off the meal, such as vanilla millefeuille and frozen pear with ginger and lemon. A big table can accommodate up to 16 people. Lunch & Dinner daily. STAY Faubourg, Sofitel Paris Le Faubourg 15, rue Boissy d'Anglas, 75008 Paris, 01 44 94 14 14. Guy Savoy presents a spring menu: Disovering or Rediscovering Gastronomy through April 25, 2015. It includes five courses and five wines for € 170. The menu is available for lunch at 12 p.m. and from 10:30 p.m. for dinner. Diners should request this menu when booking. Guy Savoy, 18, rue Troyon, 75017 Paris, 01 43 80 40 61. Chef of L'Ambroisie with his father Bernard, Mathieu Pacaud has taken over Le Divellec, a seafood landmark previously run by Jacques Le Divellec. In partnership with Jean-Louis Coste, he plans to reopen the restaurant at the latest in the beginning of 2016. Le Divellec, 107, rue de l’Université, 75007 Paris, 01 45 51 91 96. Nicolas Sale (La Table du Kilimandjaro in Courchevel) has been appointed the new executive chef of the Ritz Paris. He will helm the stoves of L'Espadon, the gastronomic restaurant of the hotel. Following three years of renovation, Ritz Paris is scheduled to reopen in late 2015. 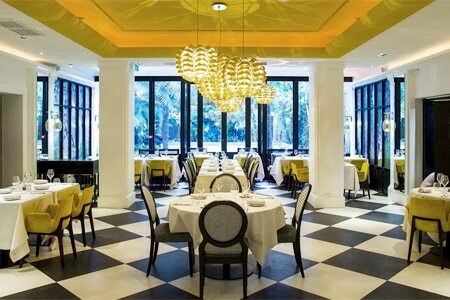 L'Espadon, Ritz Paris, 15, place Vendôme, Paris 75001, 01 43 16 30 80.